Patricia Howlin and Rachel Tucker from CTEC presenting a cheque to Ann Martin, volunteer with Dogs for the Disabled, under the watchful eye of trainee assistance dog Kyle. A Big Thank you to all our tutors and learners. Well done to tutors, learners and friends of CTEC who together have raised €2770 for our amazing charity of the year – Dogs for the Disabled. 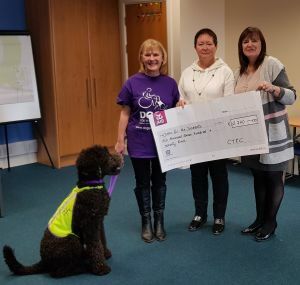 CTEC Manager Patricia Howlin was delighted to present the cheque to Ann Martin, a volunteer with Dogs for the Disabled and assistance dog Kyle. Dogs for the Disabled dogs are specially trained to assist people to carry out a range of practical tasks and to provide stability when needed. Each dog is trained to cater for the needs of their specific partner to enable them to live life with greater independence. With the funds raised this year, CTEC will be sponsoring training for Lana, a beautiful black Labrador puppy who, after her training, will be able to improve the life of a child or adults living with physical disabilities in Ireland. Thanks to all the learners from the PEIL training Healthcare and Childcare training courses who held two coffee mornings, a swop shop and a fund raising lunch. A big thank you to The Happy-Go-Lucky Fairy Door Company for contributing ‘Fairy’ items for a raffle! To all our learners who have helped us fill our collection box by donating at coffee break time – your contributions are much appreciated. 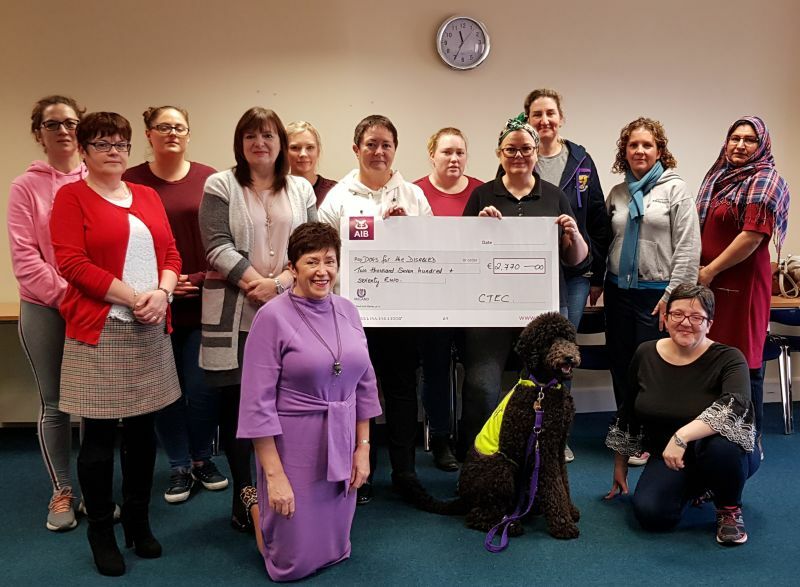 Last – but not least – a big thank you to CTEC’s tutors and staff who participated in the Women’s Mini Marathon in aid of Dogs for the Disabled and to all who sponsored them. Well done everyone! Find out More about Dogs for the Disabled. For more information on the great work carried out by Dogs for the Disabled you can check out their website https://dogsfordisabled.ie/. Visit our Facebook page for pictures of some of our Dogs for the Disabled fundraising events CTEC on Facebook.